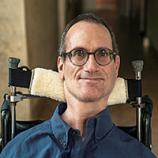 Ben Mattlin’s wife, ML, recalls falling in love with his confidence and sheer determination. On one of their earliest dates, he persuaded her to ride on his lap in his wheelchair on their way home from an Elvis Costello concert. Thirty years later, they still travel like this from time to time, undaunted by the curious stares following them down the street. But IN SICKNESS AND IN HEALTH is more than an “inspiring” story of how a man born with spinal muscular atrophy --- a congenital and incurable neuromuscular condition --- survived childhood, graduated from Harvard, married an able-bodied woman, built a family with two daughters and a cat and a turtle, established a successful career in journalism, and lived happily ever after. 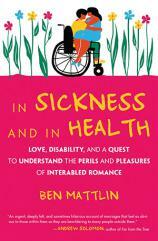 As Mattlin considers the many times his relationship has been met with surprise or speculation by outsiders --- those who consider his wife a “saint” or him just plain “lucky” for finding love --- he issues a challenge to readers: Why should the idea of an “interabled” couple be regarded as either tragic or noble? Through conversations with more than a dozen other couples of varying abilities, ethnic backgrounds and orientations, Mattlin sets out to understand if these pairings are as unusual as onlookers seem to think. Reflecting on his own experience he wonders: How do people balance the stresses of personal-care help with the thrill of romance? Is it possible that the very things that appear to be insurmountable obstacles to a successful relationship --- the financial burdens, the physical differences, the added element of an especially uncertain future --- could be the building blocks of an enviable level of intimacy and communication that other couples could only dream of? We meet Shane Burcaw, a 23-year-old writer, who offers a glimpse of his first forays into dating with a disability. There’s Rachelle Friedman, the “paralyzed bride,” as the media refers to her, and her husband, discussing the joys and challenges of a new marriage and a growing family. And Christina Crosby and her partner, Janet Jakobsen, reflect on how Crosby’s disabling accident called for them to renegotiate their roles and expectations in their long-term relationship. What emerges is a candid glimpse into the challenges and joys of interabled love --- from the first blush of sexual awakening to commitment and marriage and through to widowhood.